Saudi Arabia, Kuwait and the United Arab Emirates (UAE) have announced their decision to allocate a $2.5 billion aid package to Jordan, including a deposit into its central bank, World Bank guarantees, annual support for the kingdom’s budget over five years and financing of development projects. The announcement of the economic package came shortly after Saudi King Salman urged a Sunday meeting in Mecca, gathering Jordan’s King Abdullah II, Kuwait’s Emir Sheikh Sabah Al-Ahmad Al-Sabah and Abu Dhabi Crown Prince Sheikh Mohammed bin Zayed. Gulf monarchies are not alone in their willingness and readiness to support the strategic Arab state: the High Representative of the European Union for Foreign Affairs, Federica Mogherini, also assured Jordan of continued financial support on Sunday. She also told a press conference with Jordanian Foreign Minister Ayman Safadi that the EU has given the crisis-hit country $1.18 billion over three years, and will provide $23.5 million more for social protection programs. 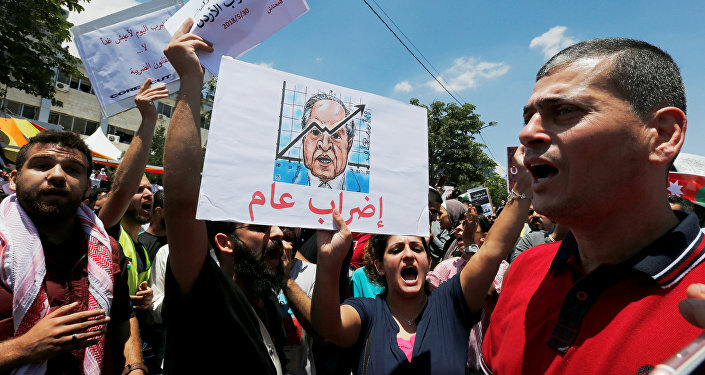 Mass rallies have hit Jordan since May 30, after the government proposed a set of economic reforms, involving price hikes and increased taxes to bring down the country’s debt level in line with the International Monetary Fund's (IMF) requirements. Jordanian Prime Minister Hani Mulki was forced to resign as a result of protests, with King Abdullah II appointing Education Minister Omar al-Razzaz to form a new government. In 2016, Jordan’s government signed a three-year loan with the IMF, which approved $723 million to support the country.